Ski-in and Ski-out of your vacation condo in Snowmass Village, Colorado. Do you love to ski? Skiers are a diverse group of people with a wide range of experiences and skills. Families and small groups enjoy taking short mountain resort vacations together where they can enjoy the perfect powder with ski-in ski-out opportunities by day, and the variety of dining and entertainment by night. This is what makes Snowmass Mountain a destination ski-in ski-out vacation for couples, families and small groups. 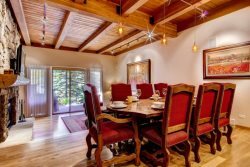 Within a couple minutes of your Snowmass luxury vacation condo is a ski lift to the top of Snowmass Mountain, the largest of four mountains in Aspen/Snowmass. Ski-in and ski-out right to/from your front door. The ski runs on Snowmass cover over 3,000 areas of variable terrain from easy to advanced, so beginners can enjoy ski lessons and the easier slopes, while the experts are accommodated with the big time slopes. Snowmass accommodates all ski levels with moderate and challenging courses. At the end of your ski day, meet everyone back at your Condo. Here's a ski-in ski-out trail map. The largest of Aspen/Snowmass's four mountains, it has 3,132 acres of skiable terrain and ridiculous variety. I love the tree skiing, but you can pretty much find whatever you'd like. You know the drill: ski from your condo, catch a lift, check out views, ski, repeat. When done, ski back to the comfy of your vacation condo. You owe it to yourself to head to Snowmass this winter because few ski mountains in America have the rugged and adventurous ski runs as this popular mountain does, and there's hardly ever a line at the lifts. The gullies are wide, uncrowded and perfectly groomed for nearly 3,700 vertical feet. Enjoy.